"From property purchase to listing and upkeep, one source for all of your needs"
Top to Bottom Inspections LLC does not collect any personal data on persons visiting this website. If you choose to contact us through e-mail or by submitting forms through U.S. Mail, the information You provide will only be used by Top to Bottom Inspections. Your information will not be given or sold to any other companies or individuals. Asbestos is particularly used in all types of materials found in building construction. It is a material that will not burn, resistant to corrosion, low in cost and readily available. Typical Building materials used in residential and commercial dwellings that can contain asbestos include but not limiting to: Floor & Ceiling Tiles, Exterior Wall & Roofing Shingles, Boiler & Pipe Insulation, Plaster and Stucco finishes etc. The Wisconsin Department of Health and Family Services requires that any asbestos inspection be conducted by a DHFS Certified Asbestos Inspector. All commercial buildings must be inspected for Asbestos Containing Material prior to any renovations/demolitions or fire burns of these buildings. 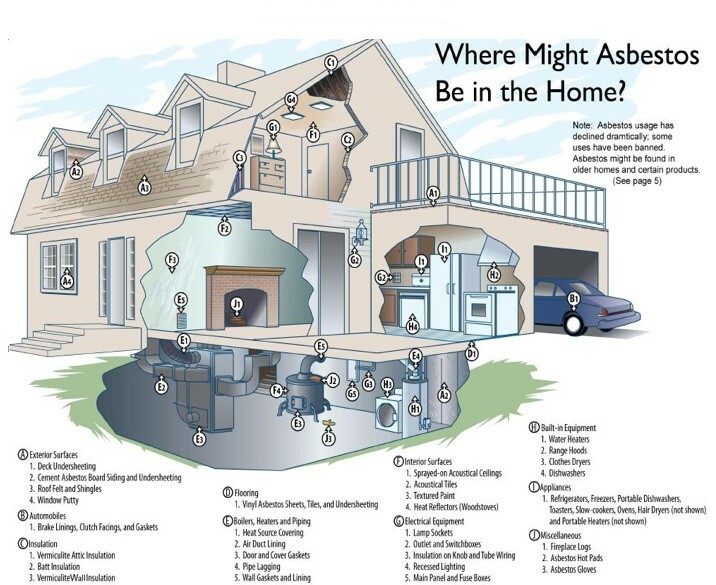 Single Family Homes generally are not required by the State of Wisconsin to obtain an asbestos inspection; however, the Wisconsin Department of Natural Recourses does require proof that all Asbestos Containing Material was removed from residential property prior to any renovation/demolition or fire burn. A lung disease first found in naval shipyard workers, asbestosis is a scarring of the lung tissue from an acid produced by the body's attempt to dissolve the fibers. 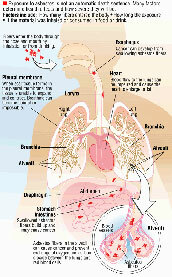 The scarring may eventually become so severe that the lungs can no longer function. The latency period (the time it takes for the disease to develop) is often 10-20 years. A cancer of the mesothelial lining of the lungs and the chest cavity, the peritoneum (abdominal cavity) or the pericardium (a sac surrounding the heart). It is believed that mesothelioma is caused by generation of reactive oxygen species (ROS) by the asbestos fibers. There is also some evidence to suggest that simian virus 40 (SV40) works together with asbestos in the development of malignant mesothelioma. Asbestos exposure is linked to at least 50% of patients developing malignant mesothelioma. Malignant mesothelioma has a peak incidence 35-45 years after asbestos exposure. Median survival for patients with malignant mesothelioma is 11 months. Asbestos has a synergistic effect with tobacco smoking in the causation of pleural mesothelioma. Cancer of the larynx has been linked to asbestos. Some studies suggest that asbestos exposure is linked to a slightly increased risk of stomach, pharyngeal, and colorectal cancer. Pricing for Asbestos Inspections may vary depending on the square footage of the property to be tested and the number of samples taken to be tested. Please contact Top to Bottom Inspections for a specialized quote to your property’s individual needs. Copyright © 2005 Top to Bottom Inspections, LLC. All Rights Reserved.